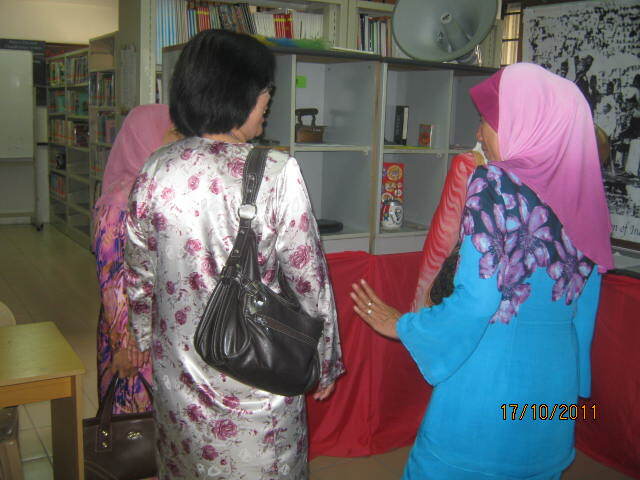 Just last Monday, our Library was inspected by officials from the state. Turns out, we're representing the entire Petaling Utama District for a competition. 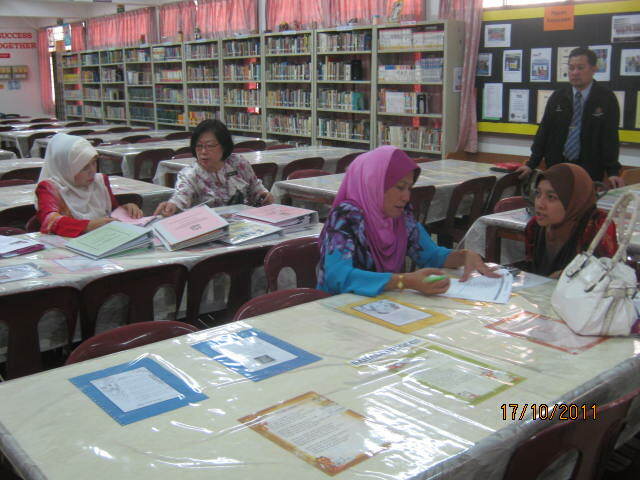 Even in the midst of the PMR examination, our beloved Library Coordinator, Pn. Tan Soa Tiam, was spotted scurrying up and down the Library, apparently getting the library in tip-top shape. After the aforesaid examinations, she finally got the extra hands she badly needed: the Form III Librarians too were scurrying alongside her hither and thither. Even some Form I and II were willing to squeeze in some chipping in into their already-hectic study schedule. After lots of paint, lace, plastic and a little elbow grease, the Library had another makeover, after the major rearranging earlier in the year. As Monday grew near, the preparations became more erratic. 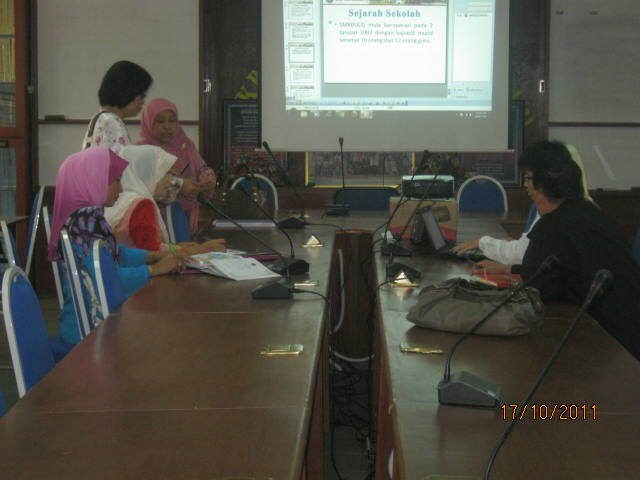 On the day itself, we were still polishing all our preparations. 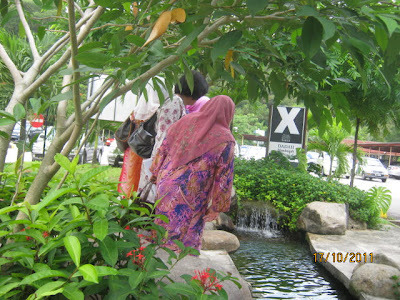 Thank goodness this is Malaysia, for it is form our nation that the notion of 'rubber time' is incredibly rampant. The officials called to say that they would be slightly late. Turns out, they came TWO hours after the predetermined time. (At least we know that they are humans too :P). When they FINALLY came, we were all spotlessly spiffy, with waistcoat and all, welcoming them ever so warmly. Leading them up the staircase into the meeting room, they were given a presentation on our beloved school, SMK Bandar Utama Damansara (3). Us Librarians, on the other hand, treated ourselves to breakfast. 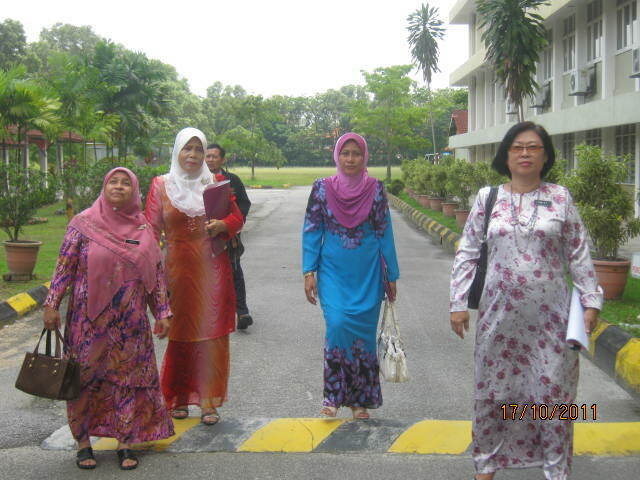 Then, the officials were brought around the school and were inspecting the school's surroundings. 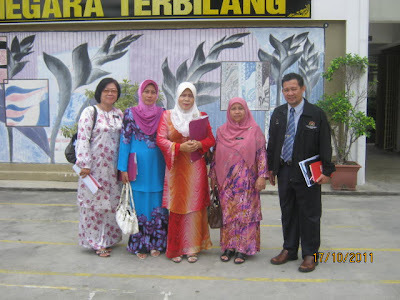 Leading them was our new Senior Assistant of Curriculum, Pn. Nasiroh. The sun bathed the school in a marvellous golden hue, so it went pretty well. On the other side, however, was not a bag of roses. A few of us even took it upon themselves to spy on them whilst scurrying across the numerous corridors! But then again, it was kind of fun, pretending to be secret agents and all, even though (we thought) our cover was blown. Last, but not least, they reached the School Resource Centre, again with the line-up of Librarians at the doorway. Then, it was strictly business, with their quizzical inquiries shot at random. Everything was meticulously examined, right up to the last fine detail.